Renal ultrasound is a painless procedure using sound waves to generate images of the kidneys and bladder. There is no ionizing radiation or intravenous dye. 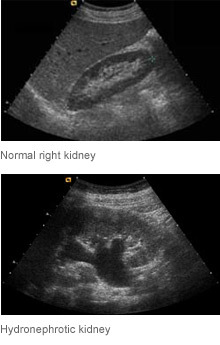 How is renal / bladder ultrasound performed? Renal ultrasound takes approximately 30 minutes. It involves lying down on a table and having warm gel placed on the abdomen while an ultrasound transducer is moved across the abdomen to generate images.